What does brothers in arms mean? Brothers in arms are men who serve together in a conflict, especially war. By extension, brothers in arms are also men who share a very close, strong relationship. Two years ago on September 9, my beloved husband Chris was killed in Afghanistan. As I mark this sad anniversary, my heart is with his brothers in arms. Reflecting upon their experiences, and upon the brothers-in-arms they lost on the battlefields, these elite troops offer both a celebration of valor, and a sobering, cautionary tale. Don’t waifu, don’t vidya, don’t buy into the internet echo chamber.[... ]Find some guys who are brothers in arms and make real world connections. Be pushed to be better.[...] Then find a wife. Where does brothers in arms come from? The phrase brothers in arms has been around since the 1480s for fellow soldiers and knights, perhaps modeled on the post-classical Latin frater in armis, a “brother in arms.” In the military, there’s historically been emphasis on the concept of fraternity and camaraderie among soldiers, and brothers in arms represents such a mentality. In the phrase, arms is used explicitly in the sense of “weapons,” ultimately originating from the Latin arma, which variously refers to troops, war, and the tools of war. Though brothers in arms originated as a means to show the unique bond between those who serve together, by at least the 1980s it was being used for strong bonds between civilian men forged by some shared experience. The expression may have expanded due to popular use for the many men who fought in World War I and World War II. Drawing upon the meaning it has for servicemen, some men refer to one another as brothers in arms to invoke the same kind of “ride-or-die” mentality that’s commonly present in soldiers. Who uses brothers in arms? In military contexts, brothers in arms is often used of soldiers after their time of service. 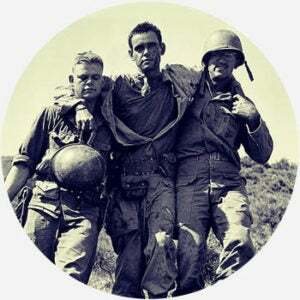 Men call each other brothers in arms (brother in arms, in the singular) in a variety of formal and informal contexts other than war, though it always suggests a resolute, unquestioned, and valorous-styled support for one another. For example, having a close friend’s back through life issues could make two men brothers in arms. The expression is common in sports, with teammates sometimes calling one another brothers in arms. Brothers in arms has also notably lent itself to popular media. British rock band Dire Straits named a 1985 album and title track Brothers in Arms, which often plays at military funerals. First launched in 2005, Brothers in Arms is also the name of a World War II-based first-person shooter video-game series. Several novels and movies have also featured brothers in arms in their titles. Though brothers in arms is more popular, a variant, sisters in arms, has also been used in much the same way since 1910, around the time when women were allowed to serve, though initially in non-combatant capacities.